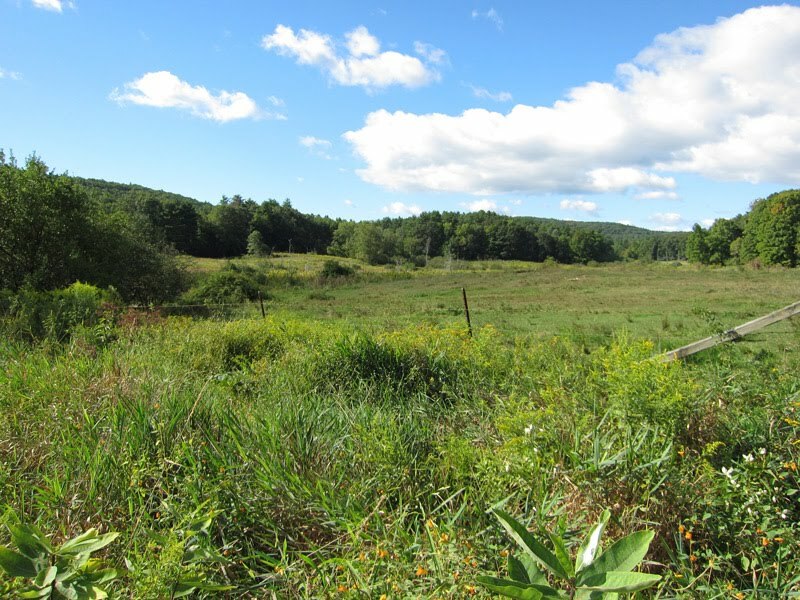 Looking south over the 'Sedge Meadow' from the yard, Gill, MA. September 5th, 2010. 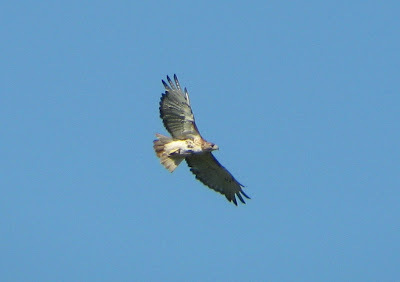 Red-tailed Hawk, one of a 'resident' pair from the yard, Gill, MA. September 5th, 2010. Image taken using Canon Powershot A560 through Leica 8x32 Trinovid binoculars. Red-shouldered Hawk, juvenile over the yard, Gill, MA. September 5th, 2010. 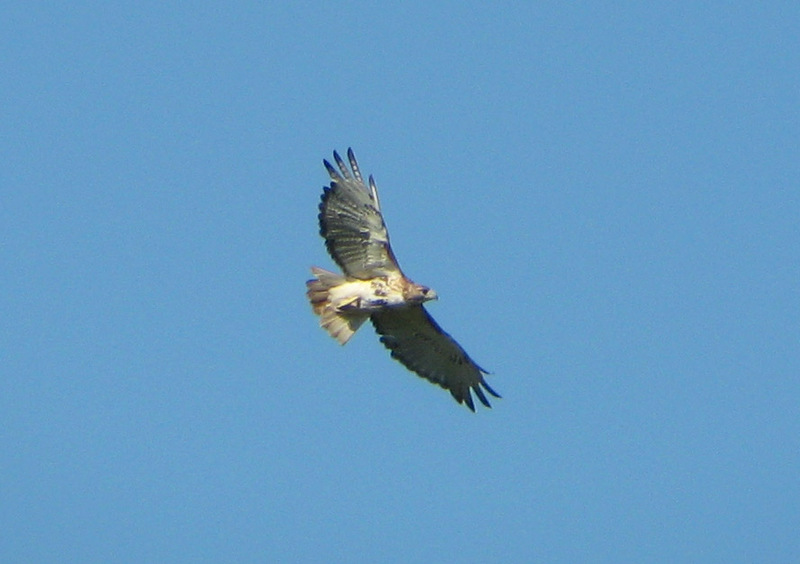 Image taken using Canon Powershot A560 through Leica 8x32 Trinovid binoculars. This young bird stuck around for at least three days but was only seen early in the morning. This shot shows the classic, pale, translucent crescents at the base of the primaries - very distinctive when seen well. 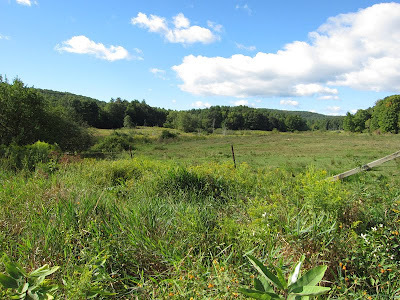 So we moved recently, finally leaving Amherst behind after a five years and finding ourselves in a distinctly rural setting just a half mile south of the center of Gill, Massachusetts. There's nothing quite like exploring new surroundings and the thrill of building up a new yard list, all of which has provided a pleasant tonic from the chaos of moving and 'still-packed' boxes. Birds appearing daily in the yard have included Ruby-throated Hummingbird, Carolina Wren, Cedar Waxing, Eastern Bluebird, Gray Catbird, Common Yellowthroat, Purple Finch and Song Sparrow. 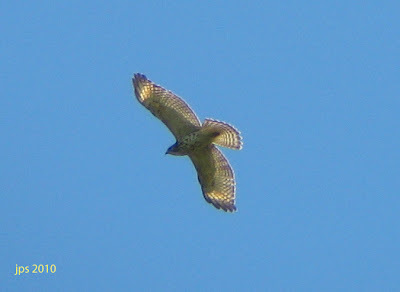 We've already found Pileated, Hairy, Downy, and Red-bellied Woodpekers, Northern Flicker and Yellow-bellied Sapsucker on or near the property and the 5th was especially good for raptors with Red-tailed, Red-shouldered, Broad-winged and Cooper's Hawks, American Kestrel and Turkey Vulture. The morning of the 7th was highlighted by a Barred Owl vocalizing just outside the house at 05:45am. 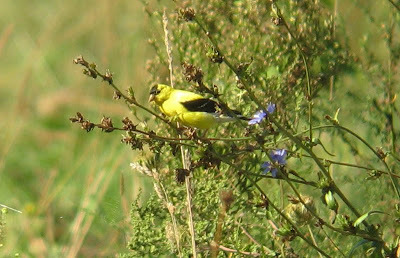 Landbird migrants have been scarce perhaps down to the warm, dry conditions and winds in the Southern quarter but the last three days produced a handful of interesting birds with most species appearing in Alders above the brook behind the house including Warbling Vireo on the 2nd, American Redstart (2), Chestnut-sided Warbler and Red-eyed Vireo on the 3rd, American Redstart, Swainson's Thrush and Philadephia Vireo on the 4th, and Barn Swallow (2), House Wren, Red-eyed Vireo and Magnolia Warbler on the 5th, Wood Thrush and Black-billed Cuckoo on the 6th and Eastern Wood-Pewee on the 7th. On the down side I have two pairs of Leica binoculars currently being repaired in New Jersey with no prospect of having them returned before October. I've also been having teething troubles working with a new digi-scoping set up so I've been doing rather badly when it comes to getting images of all these wonderful birds.